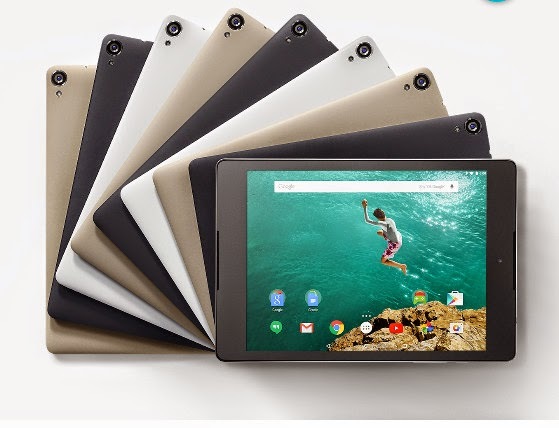 Google Nexus 9 is the first handset designed that is powered by Google’s new release “Android 5.0 Lollipop”. Well, having the new android version, you will be the first one to receive the latest android updates and enjoy all the advanced features and enhancements. Everyone got something to choose for them from over 1 million apps and games from Google Play. Well, now coming to its design, it is a perfectly designed handset for life. It is a carefully crafted device with metal frame, soft-grip back and provided with unique colors. It has a perfectly sized8.9 inch IPS LCD display that is easy to carry and also big enough on work basis and for entertainment like watching movie, videos or playing games. You can get your work done at home, at office place, or on a move with the nexus 9 keyboard folio that can be purchased separately. Well, one can say that it is designed with keeping you in mind. This android powered device is powered by a 64 bit NVIDIA tegra k1 dual-core processor with 2.3 GHz that equalizes to PC’s power and can perform all tasks like mailing, watching videos, or playing games, or documenting all at once by easily switching across tabs. It has a high sound quality. With HTC introducing its front-facing stereo sound speakers, the sounds generated are more immersive, layered and distortion free. This is the most beneficial product that Google has received after tying their bond with HTC to give us the future of smartphone’s-Nexus 9. A handset is rated top based on its specifications. There are some specifications that an android phone must be efficient in and should be considered before buying them. So let’s have a look at some of the specified specs of this handset. It runs a processor dual-core 64 bit processor, giving it an anonymous power to perform several task all at once. Besides, it comes with 2048 MB RAM, making the accessibility of the device quite faster with built-in storage capacity of 32 GB. The next specification that everyone have a look at is the camera pixel. Now-a-days everyone wish to have a high pixelate cams in their android to get a professional click as the trend of clicking pics is on high among this generation and desires to have all the features within one device. Well, it stands up to all the expectations in this field too as it provides 8 megapixels rare camera with LED Flash and auto-focus feature. Apart from this, you are also benefited with a front cam of 1.6 MP and video recording with 1080p HD resolution. Any device lags in their battery capacity but Nexus 9 had overcome this issue to with 6700 mAh battery capacity which cannot be found in any of the device. This helps you carry out your whole day with your handset. But the drawback is that this is not a user replaceable battery. These are the mostly focused specs of every device and all the general specs are same like connectivity, media, internet browsing and all. From all the discussions made, one can point out the pros and cons of this handset. Large system memory, i.e. 2048 MB RAM that makes your device fast, effective and efficient. 4G connectivity, which increases the connectivity speed with mobile data. Lacks in microSD slot, so there is no chance for storage expansion.